How does Westminster help students discover the power in their purpose? For Blake Harris, a senior from Oklahoma City, OK, the answer includes a mix of internship experience, Greek life, alumni support, leadership opportunities and the Blue Blazers Investment Committee. Blake came to Westminster to play basketball and golf and began his course work pursuing a psychology degree. Then he switched to political science until, as he puts it, “I found out not only did I not like writing papers, but I was no good at writing papers.” What he did find out he liked was the leadership training he received from his fraternity, Delta Tau Delta, and Westminster’s acclaimed Blue Blazers Investment Committee, which gives its members real world experience in managing a stock portfolio. According to Blake, the Blazers’ portfolio is currently valued at an astounding $610,000. Fortunately, for Blake, the other piece of the puzzle that fell into place for him at Westminster was the tremendous influence of an alumnus who has mentored many Westminster students over the years, Brock Ayers ’82. A Delt brother, Brock was a great source of advice and counsel to Blake when Blake served as president of the Delt House. Even more importantly, Brock is the founder and advisor to the Blue Blazers and encouraged Blake to get involved in the Blazers, which ultimately resulted in a decision that was life changing. Every two years the Blazers take a trip to New York City where they visit all the major Wall Street financial institutions and the New York Stock Exchange, and they have the opportunity to interact with successful alumni from the business world. Blake was chief administrative officer of the Blazers when Brock encouraged him to go on the 2016 trip. That experience opened the door to Blake’s future plans. Returning from New York, Blake changed his major to business administration. 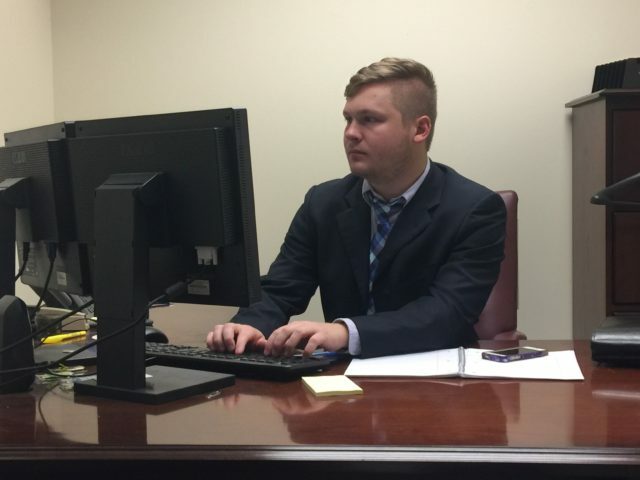 Brock advised Blake to apply for an internship with Wells Fargo Advisors where Brock is employed as Vice President of Investments for the Chesterfield branch. Another Westminster graduate, Will Miller ’16 participated in the same internship last year and told Blake how much he had learned from it. Blake applied and, after a successful interview, received the internship. From June 5-August 11, 2017, Blake interned at the Chesterfield branch of Wells Fargo. From the first day it was evident to Blake he was not just there to do “busy work.” He was a member of the team. “I walked in and found I had my own office with two computers and two monitors, and it became clear immediately that I was in a family-oriented culture where everyone cared about each other,” he says. The internship also gave him the opportunity to network with many of those from the industry in the St. Louis area. He recalls fondly one particular financial advisor in his office that was only 25 days away from retirement who spent a great deal of time helping him. The Wells Fargo internship experience solidified to Blake that this is the direction he wants to take his career. The first day he helped a client of Brock’s who had dementia set up a plan to see that his bills were paid on time. Blake’s grandfather passed away from Alzheimer’s so he knew what a great service he had helped accomplish. Blake has great advice to other students. He stresses the importance of attending Westminster’s career fairs to take advantage of networking opportunities there. He also emphasizes the importance of seeking leadership roles. “I may not have the highest GPA on campus but I was able to get my summer internship because of my leadership roles on campus,” says Blake, who is also current president of the Interfraternity Council. His other advice is to network with Westminster alumni every change possible.